Nintendo of Japan have announced that they will be streaming a brand new Nintendo Direct video for their Japanese audience later this week. 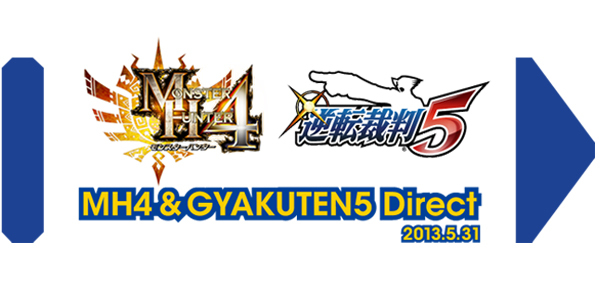 The presentation, titled “MH4 & GYAKUTEN5 Direct” will be specifically pertaining to the latest entries in the Monster Hunter and Phoenix Wright franchises; Monster Hunter 4 and Phoenix Wright: Ace Attorney Dual Destinies. This specific Nintendo Direct video is intended for the Japan market and as such will be streamed entirely in Japanese. However for those who are interested, you can check it out here (The video goes live at 9pm AEDT on Friday). It is probably a safe bet that these two titles, at least in passing will be mentioned during Nintendo’s E3 Direct on June 11th. Regardless, we will be watching the presentation and posting all the information that we can make heads or tails of, so be sure to stay tuned to Capsule Computers for all the updates regarding Monster Hunter 4 and Ace Attorney Dual Destinies. Any OBJECTIONS to this movie idea?